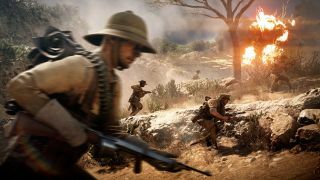 EA is offering Battlefield 1 players the chance to grab another one of the game’s expansions at the supremely tempting cost of absolutely nothing. Yes, the Turning Tides expansion is now free for PC gamers over at the Origin store in the US and Europe (and also for console owners on the PS4 and Xbox One). It normally retails at $14.99/£14.99, but bear in mind this offer will be for a limited time, as in previous cases (although EA hasn’t specified a deadline, we’d advise you move sooner rather than later – the first freebie ran for a fortnight, but it might be just a week). Turning Tides shifts its attention to naval battles and beach landings, and adds the British Royal Marines, a new Conquest Assault mode, the Infiltrator Elite class, along with a new destroyer and airship, fresh weapons and maps, with more besides. This follows on from EA giving away the first two expansions for Battlefield 1 last month: They Shall Not Pass and In the Name of the Tsar. Presumably, we can expect a giveaway of the final expansion for the game, Apocalypse, to follow next month. This is all part of the lead-up to the launch of Battlefield 5, which is due to land in October. Battlefield 1 is expected to get a new mode called Shock Operations, which should arrive at some point later today, but following this, monthly updates for the game will cease. Obviously enough, EA will be fully focusing on the new title in the franchise going forward. Battlefield 5 shifts the setting to World War 2 and makes some interesting introductions that include a new co-op mode.